But those findings are misleading, according to research in the lab of Whitehead member and MIT biology professor Rudolf Jaenisch. In a paper published online in Cell Stem Cells on Oct. 10, postdoctoral fellow Christopher Lengner has shown that Oct4 is not required to maintain mouse adult stem cells in their undifferentiated state, and that adult tissues function normally in the absence of Oct4. Furthermore, using three independent detection methods in several tissue types in which Oct4-positive adult stem cells had been reported, Lengner found either no trace of Oct4, or so little Oct4 as to be indistinguishable from background readings. "This is the definitive survey of Oct4," said Jaenisch. "It puts all those claims of pluripotent adult stem cells into perspective." Oct4 is essential in maintaining the pluripotency of embryonic stem cells, but only for a short time before the embryo implants in the uterine wall. After implantation, Oct4 is turned off and the cells differentiate into all of the 200-plus cell types in the body. "We have convincingly shown that Oct4 has no role in adult stem cells," said Lengner. 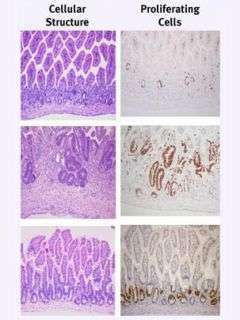 He initially set out to determine how tissues previously shown to express Oct4 (the intestinal lining, brain, bone marrow and hair follicle) functioned without the protein. To do so, he bred mice in which the Oct4 gene had been deleted from a given tissue type. Next, Lengner stressed the tissue in several ways, forcing the adult stem cells within to regenerate the tissue. All regenerated normally. Lengner and his fellow researchers then tested to confirm that Oct4 had indeed been deleted from these cells. Finally, the researchers set out to validate the previously published reports claiming Oct4 was expressed in these adult stem cell types. Using highly sensitive tests that could detect Oct4 at the single-cell level, they were unable to confirm the earlier reports. "This is a cautionary tale of believing what you read in the literature," said Lengner, who suggests that earlier studies may have misapplied tricky analytical techniques or worked with cell cultures that had spent too much time in an incubator. "We now know that adult stem cells regulate their pluripotency, or 'stemness,' using different mechanisms from embryonic stem cells, and we're studying these mechanisms," he said. "Is there a common pathway that governs stemness in different adult stem cells, or does each stem cell have its own pathway? We don't yet know." Other authors of this paper are from Massachusetts General Hospital, the Max Planck Institute for Molecular Biomedicine and the Russian Academy of Science.